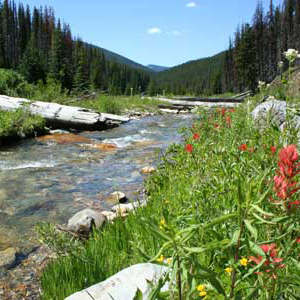 The Sherlock Creek site is in a very remote location in the upper reaches of the St. Joe River Basin nearly at the Idaho-Montana divide southwest of Superior, Montana. This site is a high priority restoration opportunity, because it will restore over a mile of important fisheries habitat in a federally designated Wild and Scenic River Basin, the St. Joe. It is home to westslope cutthroat trout (Oncorhynchus clarkii) and other aquatic species, and is habitat for a bull trout (Salvelinus confluentus) population stronghold. Bull trout strongholds are important, because the species is federally listed as threatened under the Endangered Species Act. Restoration at the site was needed as a result of poor mining practices. The Weiss placer mine disturbance encompasses over 20 acres of Sherlock Creek’s floodplain which is located in a USFS roadless area. The actual resource extraction practices over the last 30 years at the site can only loosely be described as “mining,” and have been destructive to the aquatic ecosystem of Sherlock Creek. Cutthroat trout actively spawn in Sherlock Creek and bull trout still actively spawn below the site as well as in adjacent streams. Any unnatural fine sedimentation that occurs upstream of fish spawning areas can smother eggs laid in streambed gravel nests. 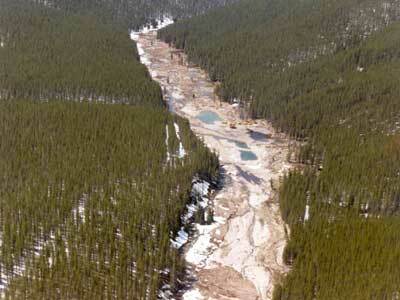 Stream sedimentation is a continuing problem originating from this mine site on Sherlock Creek. Legal action was originally taken against the site’s original occupant in the early 1970s due to his unreasonably damaging placer mining practices. A 30-year legal history has since evolved, climaxing in a federal civil case filed in 2003 by the United States Attorney for the District of Idaho. Summary judgment was granted to the United States which included a recent court order allowing the USFS to proceed with restoration of the site. Work accomplished at the Sherlock Creek site focused on rebuilding and enhancing over one mile of channelized stream and tributary routes. Total floodplain reconstruction was needed in many areas to improve the site’s long-term hydrologic stability. In 2007, 86 pieces of derelict equipment and machinery parts, including multiple bulldozers and a large dredge, were removed from the floodplain. Additionally, nearly 100 tons of contaminated (hydrocarbon) soils and appreciable amounts of trash were removed from the site. Logs and root wads were brought in and approximately 4000 feet of new stream channel was constructed with 12 acres of floodplain/channel area restored at the site. This included a significant amount of vegetation planting. The old stream channel underwent recontouring and revegetation as well. This work: 1) created a stable stream channel and floodplain, 2) reduced sediment that is entering the stream channel, 3) established a native vegetation community, 4) created pond habitat for wetland dependent species, and 5) improved instream fish habitat. The restoration work at this site improves riparian resources, surface waters, and fish habitat. The result is of great benefit to a true bull trout stronghold for the St. Joe River/Coeur d’Alene Lake system and represents a very high quality native trout restoration. The Trustees played an important role as a partner in this project. 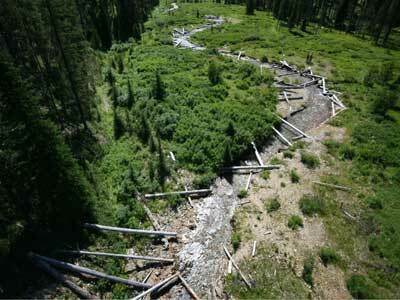 In particular, the Forest Service acted as the Lead Trustee and performed administration and oversight. The U.S. Fish and Wildlife Service and National Fish and Wildlife Foundation contributed funds to make it happen. The University of Idaho and the North Idaho Fly Casters provided generous volunteer support for on-site activities.